Ann M. Tomawski (nee Machnik) age 90, of Las Vegas, passed away peacefully on Monday, May 21, 2018 at Desert View Senior Living, Las Vegas. Born December 4, 1927 in Lorain, she was a long-time resident of Lorain where she graduated from Lorain High School. 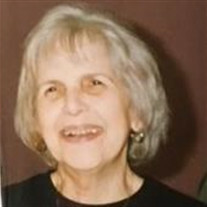 Ann was a long-time member of the former St. Stanislaus Catholic Church, Lorain, where she volunteered with the PTA, cooking for functions at the church and other church activities. She was an avid golfer and above all she enjoyed traveling with her husband and spending time with her family. Ann is survived by her daughters, Patricia (Walt Morrill) Tomawski of Las Vegas, NV and Donna (George Buzas) Tomawski of Raleigh, NC; sisters in law, Jean Machnik and Ernestine Machnik, as well as many nieces and nephews. She was preceded in death by her husband of 53 years, Edmund Tomawski in 2000; parents, Anthony and Mary Machnik; brothers, Theodore (Lillian) Machnik, John Machnik and Joseph Machnik; sisters, Frances Machnik and Helen (Andrew) Scislowski. The family will receive friends on Wednesday from 6-8 pm in the Dovin Funeral and Cremation Specialists, 2701 Elyria Avenue, Lorain where funeral services will be Thursday at 9:30 am followed by mass at 10:00 am at Nativity of the Blessed Virgin Mary Church, 418 W. 15th Street, Lorain. Ann's nephew, Rev. Ted Machnik of St. Joseph Catholic Church, Circleville, Ohio, will officiate. Burial will follow in Calvary Cemetery, Lorain.